This fun Starfish Beach pen set is the perfect accessory for your guest book table. The base is accented embossed starfish designs and perfectly place crystals. When holding the included pen, set stands 8" high. 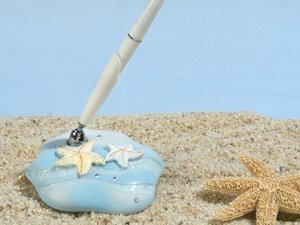 Each set comes gift boxed.Also search our site for the entire Starfish Beach Reception Set - which includes cake servers, toasting flutes, guest book and pen set.